Kristen made Calzones the other night, not the sad combinations of salted meats and cheap cheeses that they call calzones here in California, but real New York food, stuffed to the breaking point with whole milk Ricotta and Mozzarella cheeses. They’re rich, creamy and insanely delicious, especiall with a sprinkle of Oregano in the filling to give it just a little spice. The dough will make two large calzones. 1) Dissolve 1 pk yeast in 1 cup warm water. 2) Mix 1 TBSP sugar, 2 TBSP oil, 1 tsp salt, 2 3/4 c flour to yeast and water. 3) Mix together till smooth. Knead and cover with towel for 30 minutes. Roll out dough approx. 10″ circle if you’re making them by hand. (Or large enough to cover the open surface of a calzone maker/mold.) Put appoximately 1 to 1 1/2 cups whole milk ricotta cheese in the center of the dough. Place 1/2 to 1 cup of grated whole milk mozzarella cheese on top of the ricotta cheese. Fold over and crimp shut. Place on greased cookie sheet. Brush with melted butter (after 15 minutes of cooking). Cook for a total of 25 minutes at 375 degrees or until golden brown. 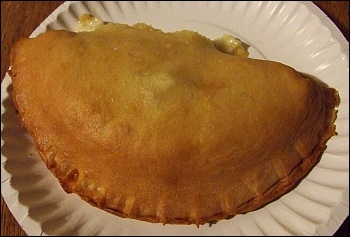 You can add many kinds of ingredients if you want to go beyond the basic, but delicious, cheese calzone. Pepperoni or cooked italian or pan sausage make a nice addition, for instance, as well as sauteed onions and peppers – if you add ingredients, reduce the amount of cheese in proportion so the calzones don’t get overstuffed and pop open during baking. You can also use the dough recipe here to make an excellent pizza crust.